Although Dr. Scott Radke graduated in 2016 with his DVM and is currently enrolled in graduate studies in the college, he hasn’t forgotten his alma mater. 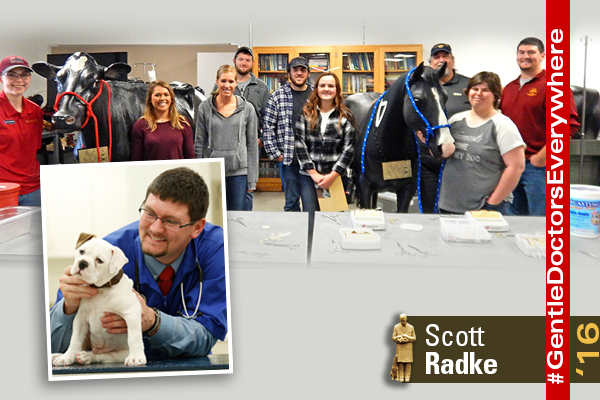 So, when the Pre-Vet Club at Buena Vista University called, Radke arranged a behind-the-scenes look at the college’s research opportunities as well as a tour of the Clinical Skills Laboratory. “Discussing expectations both for acceptance and success in a DVM program gave our students a certain level of confidence in believing that Iowa State’s College of Veterinary Medicine is a goal they can reach,” said Dr. Melinda Coogan, BVU professor of biology.